Daly Industrial Supplies-Stihl Premier Youth League:Leeside/Knockraha 2 Cobh Ramblers 2. Daly Industrial Supplies-Stihl Premier Youth League: Avondale United 1 Cork City 3, Carrigaline United A 4 Greenwood 2, Castleview 3 Rockmount 3, Everton v Douglas Hall postponed. Do you want to be in the running for the Murphy’s Stout team-of-the-month for March? Henry Healy, 19 Inniscarra Road, Fairhill, before Friday, April 9. Murphy’s Irish Stout Premier League: Leeside v Park Utd (off); Village Utd 1 Wilton Utd 3. Premier A: Greenwood v Ballyvolane (off). Shandon Cel 3 Postal Cel 0; St John Boscos v Richmond (off); UCC v Dunbar Cel (off). League 1A: Ballyvolane 3 Passage 1; Bohemians’ v Dillon’s Cross (off); Park Utd v Mayfield Utd (off); Buttevant v Rathcoole (off). League 2: Casement Cel 2 City Wanderers 6; Wilton Utd v Lakewood Ath (off). Coachford 1 Millstreet Cel 2; Crescent Ath 1 Waterloo 2; Inter City Cel 0 Springfield “A” 2; UCC 2 Afton Villa 2. Here are some Interesting observations after tonight’s games. League 1: Grangevale leapfrog Douglas Hall to second spot after their 2-1 win over the Hall. Killumney are starting to come into the picture after their 6-2 win away to Killreen. Shandon continue to improve on their form after a 3-0 home win over Postal. League 2A: Waterloo hold on to top spot with a 2-1 win away to Crescent who suffered their first league defeat of the season, but Millstreet are starting to look menacing as they move into second place after winning 2-1 away to Coachford and Springfield A are also making their presence felt after a 2-0 win away to Inter City. With the midweek games commencing tomorrow night and Thursday, can you please ensure you text in your results in to me a.s.a.p after the game. Makes no difference whether you are at home or away. Your response to this request will determine how accurate\inaccurate tables will be when published. Macroom Soccer Club are having their annual race night on Sunday the 4th of April in Murray's Bar Macroom, with the first race off at 9pm. DISC-Viking U17 Premier League: Castleview 1 Avondale United 3. Daly Industrial Supplies-Stihl Youth League 1: Ballincollig 2 Midleton 3, Passage 3 Kanturk 2, Park United walkover from Lakewood Athletic, Ringmahon Rangers 0 Innishvilla 1, Carrigaline United B 0 Ballyvolane 1. FAI Umbro Youth Inter League quarter-final: Cork Youth League 3 Dublin & District Schoolboys League 1. DISC-Viking U17 Premier League: Carrigaline United v Greenwood postponed, Kilreen Celtic 1 Cork City 2. DISC-Viking U17 League 1: Everton 0 Rockmount 4, Lakewood Athletic 3 College Corinthians B 2, Leeds 2 Coachford/Killinardrish 0, Leeside/Knockraha 2 Buttevant 2, Tramore Athletic 4 Ballincollig 4, Youghal United 1 Mallow United 4. Munster Lucozade Sport Junior Cup quarter-final: Leeside 0 Pike Rovers 2. Murphy’s Irish AOH Cup quarter-final: Douglas Hall 4 Blackstone Rovers 1; Knockavilla Cel 0 Carrigtwohill Utd “A” 0 (Knockavilla won 4-2 on pens aet); Macroom “A” 2 CFC Banteer 1. Murphy’s Irish Stout St. Michael’s Cup semi-finals: Dillon’s Cross Ath 1 Bohemians 0; Passage 3 Rathcoole Rovers “A” 0. Murphy’s Irish Stout Saxone Cup semi-finals: Casement Cel 1 Glenvale 3; Millstreet Cel 5 Hibernians “A” 1. Murphy’s Irish Stout Corinthian’s Cup 3rd round: Kilreen Cel 5 Cathedral Cel 4 (aet); Corkbeg 2 St John Boscos “A” 0; Killowen 2 Crescent Ath 3; Wilton Utd 2 Donoughmore Ath 1; Greenwood “B” 1 Mayfield Utd 7. Murphy’s Irish Stout Premier League: Grattan Utd 1 Coachford 0; Kinsale 1 Park Utd 0; Wilton Utd 6 Village Utd 0. Premier A: Castleview 1 Kanturk 1; Ballyvolane 4 Greenmount Rangers 0; Leeds 3 Greenwood 1. League 1: Postal Celtic 1 Grangevale; Killumney Utd 9 Ballintotis 1; Dunbar Cel 2 Watergrasshill Utd 1. League 1A: Ballyvolane 2 Rylane Cel 0; Park Utd 1 Buttevant 0. League 2: City Wanderers 0 Innishvilla 4. League 2A: Castle Cel 0 Waterloo 2; Glanworth Utd 3 Springfield “A” 7; Coachford 4 Hillington 1. Springfield “B” 1 Knockraha 1. League 3: Carrigtwohill Utd 0 Afton Villa 3; Dunbar Cel 3 UCC 2; St John Boscos 2 De Courcy Albion 3. League 3A: Ballinhassig 3 Rathcoole Rovers 1; Grattan Utd 2 Macroom 3; Los Zarcos 2 Strand Utd 4. League 3: Carrigtwohill Utd 0 Afton Villa 3; Dunbar Cel 3 UCC 2. With the midweek games commencing next Tuesday and Thursday, it will be essential that everyone text their results in a.s.a.p. after the games. Otherwise, the tables published will not be accurate if results are missing. FAI's Michael Hyland receives presentation from Cork AUL and, below, Ballincollig v Castleview (red) goes to spotters on a frosty morning. The head shot is of Mick Savage of Ballincollig. Cork Youths v D D S L , ( Dublin District Schoolboys League ). Date: Sunday next 28th March. All support Welcome on the day. Members, friends and all involved at Blarney Street Athletic AFC wishes to extend their deepest sympathy to the Thompson family on their recent bereavement of Mrs Mary Thompson. From top left, clockwise Killumney (left), Passage, ref Derry Barrett, John Murphy (AUL Youth mangr), Vince Cummins (AUL), John O'Sullivan (AUL), Denis O'Driscoll (AUL), Tony Fitzgerald (AUL), Flor Mehigan (AUL jnr mngr), Mick Sheahan (Killumney mngr). Daly Industrial Supplies-Stihl Premier Youth League: Castleview 7 Fermoy 3, Cobh Ramblers 3 Rockmount 1, Douglas Hall 1 Carrigaline United 1, Everton 2 Avondale United 2, Greenwood 1 Leeside/Knockraha 2. Daly Industrial Supplies-Stihl Youth League1: Ballincollig v Kanturk postponed, Carrigaline United B 3 Lakewood Athletic 2, Ringmahon Rangers 3 Ballyvolane 5. DISC-Viking U17 Premier League: Avondale United 0 Kilreen Celtic 4, College Corinthians A walkover from Castleview, Cork City 5 Greenwood 3, Glounthaune United 0 Carrigaline United 3. DISC-Viking U17 League 1: Ballincollig 1 Youghal United 4, Buttevant v Tramore Athletic abandoned (Buttevant leading 3-2), Coachford/Killinardrish 2 Rockmount 2, College Corinthians B 0 Mallow United 3, Lakewood Athletic 3 Leeds 1, Leeside/Knockraha 1 Everton 1. No fixtures for next week received yet. Murphy’s Irish Stout County Cup quarter-finals: Passage 0 Carrigtwohill Utd “A”2; Killumney Utd 3 Innishvilla 0. Murphy’s Irish Stout Count Cup 3rd round: Leeside “C” 1 Churchvilla 0. Murphy’s Irish Stout Premier League: Coachford 2 Village Utd 1; Grattan Utd 2 Wilton Utd 0; Kinsale 0 Glenthorn Cel 1; Park Utd 1 Knockavilla Cel 2; Leeside 5 Blarney St Ath 0. Premier A: Blackstone Rovers 2 Castleview 0; Kanturk 3 Leeds 5; Ballyvolane 3 Pearse Cel 1; Macroom 3 Greenmount Rangers 1. 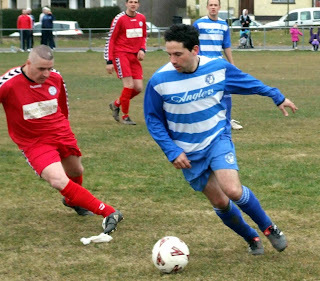 League 1: Richmond 2 Dunbar Cel 4; Postal Cel 1 UCC 0; Leeside v Grangevale (off); St John Boscos 0 Shandon Cel 7. League 1A: Ballyvolane 2 Fairview 5; Bohemians 3 Donoughmore Ath 3; Buttevant 1 Park Utd 2; Mayfield Utd 2 Rathcoole Rovers 1; Rylane Cel 2 Glen Cel 0. League 2: City Wanderers 0 Lakewood 0; Glenvale 7 Wilton Utd 1; Hibernians 2 Blackpool Cel 1; Kinsale 0 Casement Cel 2. League 2A: Glanworth Utd 0 Waterloo 2; Killowen 1 Castle Cel 4; Hillington 0 Crescent Ath 5; Inter City Cel 1 Coachford 4; Millstreet Cel 3 Springfield “A” 1. League 2B: Central Rovers 3 Carrigaline Utd 2; Cathedral Cel 1 Knockraha 1; Leeview Ath 0 Knocknaheeny Cel 3; Springfield “B” 2 Corkbeg 1. League 3: Carrigtwohill Utd “B 0 De Courcy Albion 1; Dunbar Cel 3 St John Boscos 2; Hibernians B 1 Greenwood B 1; Afton Villa 2 UCC 0; Brooklodge Utd 2 Parkview Cel 0. League 3A: Macroom 3 Rathcoole Rovers 0 (W\O); Ballinhassig 1 Strand Utd 1; Los Zarcos 4 Grattan Utd 5. Lucozade Sport Munster Junior Cup semi-final draw. Games to take place on or before 18th April 2010. Venues to be decided by the MFA. The quarter finals of the cup will take place on Sunday 28th March 2010 with the exception of the Villa / Nenagh game which takes place on Sunday 4th April 2010. 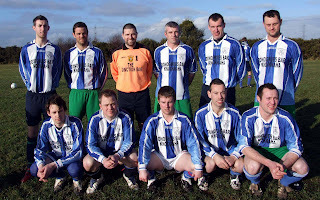 The Knockraha team that were crowned Champions of 2B after defeating Carrigaline 4-2 on St. Patrick's Day. Murphy Youth Cup second round: Passage 0 Cork City 8. Murphy Youth Cup semi-final: Carrigaline United 6 Fermoy 1. Leeds 2 Lakewood Athletic 2, Leeside/Knockraha 1 Tramore Athletic 0, Rockmount 6 Buttevant 3. Murphy’s Irish Stout AOH Cup 4th round: Ballyvolane “A” 1 Leeside “A” 2. Murphy’s Irish Stout St. Michael’s Cup quarter-final: Ballyvolane “B” 0 Bohemians 2. Murphy’s Irish Stout Saxone Cup quarter-finals: Millstreet Cel 2 Waterloo 1 (aet); Springfield “A” 0 Glenvale 0 (Glenvale won 4-2 on pens aet). Murphy’s Irish Stout City Cup quarter-final: Blackpool Cel 3 Central Rovers 2. Murphy’s Irish Stout County Cup 2nd round: Churchvilla 3 Carrigtwohill Utd “B” 1. Greenwood “B” 4 Glanworth Utd 4 (Greenwood won 4-3 on pens aet). Murphy’s Irish Stout Premier League: Blarney St Ath 1 Kinsale 3; Grattan Utd 2 Village Utd 1; Knockavilla Cel 3 Coachford 0; Park Utd 1 Wilton Utd 2. Premier A: Blackstone Rovers 2 Leeds 1; Castleview 2 Pearse Cel 2; Greenmount Rangers 0 Greenwood 2; Macroom 1 Kanturk 0. League 1: Grangevale 1 Kilreen Cel 3; Killumney Utd 9 Watergrasshill Utd 1; Leeside 0 UCC 1; Shandon Cel 1 Dunbar Cel 5; St John Boscos 0 Postal Cel 0 (game abandoned). League 1A: Rathcoole Rovers 3 Buttevant 1; Dillon’s Cross Ath 0 Fairview 2; Glen Cel 1 Donoughmore Ath 0; Rylane Cel 4 Passage 0. 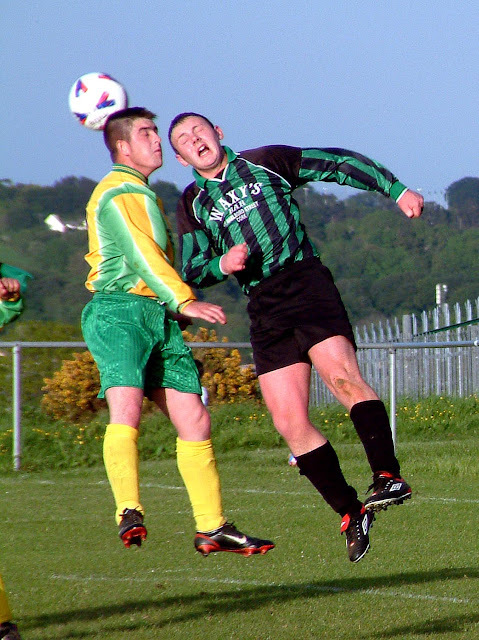 League 2: Ard-na-Laoi 1 Kinsale 4; Casement Cel 0 Innishvilla 3; Hibernians 1 Lakewood Ath 1. League 3: De Courcy Albion 0 UCC 4; Hibernians 0 Brooklodge Utd 9; Leeside 1 Dunbar Cel 0. Murphy’s Irish Stout League 3A: Ballinhassig 2 Grattan Utd 1; CFC Banteer 4 Los Zarcos 0; Strand Utd 3 Macroom 1. The 3A fixture next Saturday, March 20 between Watergrasshill and Ballinhassig is changed to Watergrasshill V CFC Banteer. FAI Umbro Youth Cup fifth round: Innishvilla 1 Newbridge Town 5. Munster Lucozade Sport Youth Cup semi-final: Cork City v Granville Rangers. Carrigaline United 4 Avondale United 1, Castleview 6 Everton 1, Douglas Hall 4 Greenwood 2, Fermoy 0 Cobh Ramblers 0, Rockmount walkover from Leeside/Knockraha. Kanturk 1 Park United 2, Midleton 2 Ballyvolane 0, Passage 3 Ballincollig 2, Ringmahon Rangers 0 Lakewood Athletic 1. DISC-Viking U17 Teddy Healy Cup semi-final: Greenwood 1 College Corinthians A 2. DISC-Viking U17 Premier League: Avondale Utd 3 Glounthaune United 0, Carrigaline United v Kilreen Celtic postponed, Castleview 1 Cork City 2. DISC-Viking U17 League 1: Buttevant 7 Coachford/Killinardrish 2, College Corinthians B 2 Ballincollig 2, Everton 1 Tramore Athletic 3, Mallow United v Leeds postponed, Rockmount 2 Lakewood Athletic 1, Youghal United 0 Leeside/Knockraha 4. Murphy’s Irish Stout AOH Cup 4th round: Churchvilla 0 CFC Banteer 1; Macroom “A” 3 Park Utd “A” 2. Murphy’s Irish Stout AOH Cup 3rd round: Leeside “A” 1 Springfield “A” 0. Murphy’s Irish Stout St. Michael’s Cup quarter-finals: Leeside “B” 2 Rathcoole Rovers “A” 2 (Rathcoole won 11-10 on pens aet); Passage 6 Killumney Utd 3. Murphy’s Irish Stout Saxone Cup quarter-finals: Hibernians “A” 2 Knockraha 2 (Hibs won 5-4 on pens aet); Casement Cel 2 Blackpool Cel 1. Murphy’s Irish Stout President’s Cup semi-final: Afton Villa 0 Grattan Utd 1 (aet); Strand Utd 3 Brooklodge Utd 1. Murphy’s Irish Stout City Cup quarter-final: Mayfield Utd 0 Douglas Hall 1; Wilton Utd “B” 3 Bohemians 1. Murphy’s Irish Stout County Cup 3rd round: Waterloo 2 Richmond 2 (Richmond won 6-5 on pens); Springfield “B” 0 Millstreet Cel 3; Park Utd “B” v Ballintotis (W/O). Murphy’s Irish Stout Corinthian’s Cup 2nd round: Corkbeg 3 St John Boscos “B” 2 (aet); Postal Cel 0 Donoughmore Ath; 1 Leeside “C” 5 Parkview Cel 0; UCC “A” 5 Shandon Cel 4 (aet); Killowen 1 Hillington 0; Grangevale 1 Dunbar Cel “B” 1 (Dunbar won 4-1 on pens aet); De Courcy Albion 1 Crescent Ath 6; St John Boscos “A” 3 Ard-na-Laoi 2. Murphy’s Irish Stout Premier League: Blarney St Ath 1 Grattan Utd 3; Village Utd 1 Coachford 0; Wilton Utd 5 Glenthorn Cel 0. Premier A: Greenmount Rangers 0 Pearse Cel 1; Kanturk 1 Blackstone Rovers 0; Greenwood 0 Castleview 1; Leeds 2 Ballyvolane 1. Murphy’s Irish Stout league 1: Watergrasshill Utd 3 Dunbar Cel 6. League 1A: Buttevant 1 Fairview 1; Glen Celtic 4 Dillon’s Cross 4. League 2: Lakewood Ath 1 Glenvale 3; Innishvilla 3 Kinsale 0. League 2A: Castle Cel 1 Inter City Cel 4. League 2B: Central Rovers 3 Knocknaheeny Cel 2. League 3: Carrigtwohill Utd 2 Greenwood B 2. League 3A: Macroom 5 Watergrasshill Utd 0; Ballinhassig 3 Los Zarcos 2. Grattan's John Kelleher who was man-of-the-match in their 3-1 win over Blarney Street at the Fairfield to-day. Please be aware that Martin Conlon (Secretary Cork AUL) will not be contactable until 26-Mar-10. In Martin's absence, Denis O'Driscoll will deputise in the role of Secretary for the duration. Home Address: "Maryville", Ardmanning Avenue, Togher, Cork. The Cork Youth League will have to travel for the Semi Final, if they get the better of the DDSL in the Quarter Final and also the Final of the FAI Umbro Youth Inter League competition if they win their semi final encounter. The Waterford League on the other hand was favoured with home draws up to and including the Final of the competition if they qualify. Carrigaline Utd have been given a great incentive to win their away semi final tie against Rathkeale or South End United as the Final will be played in Cork if Carrigaline qualify. Derek Delea Leeside, Johnny Barret Leeside, Brian McCarthy Leeside, Brendan Hurley Kinsale, Derek McCarthy Kinsale, Daniel Syrlls Kinsale, Mick Bradfield Kinsale, Ger Harrington Kinsale, Eric Shinkwin Grattan, Brian Sullivan Grattan, John Kelleher Grattan, Sean Moynihan Douglas Hall, John Sull Castleview, Anthony Peelo Blarney St, John Betts Blarney St, Laurence Betts Blarney St, Shane O Neill Wilton, Keith Whyte Knockavilla, Rob Walsh Knockavilla, Peter Krzanowski Knockavilla, John Dennehy Kanturk. Knockavilla Cel v Carrigtohill Utd "A"
Passage v Carrigtohill Utd "A"
Sunday 14th March kick off 10-45, unless Stated. v In all Cup games the match will be reversed if home team’s pitch is unplayable. v Ensure there is not a clash of colours, home team are advised to bring 2nd set of jerseys to avoid any clashes. v Any referees unable to staff games must contact the referee Liaison Officer, Eddie Mullins, and must inform the league and the home team of details of any change.